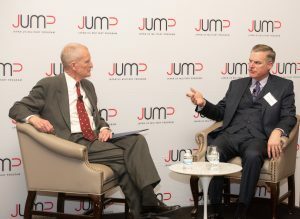 Admiral Dennis Blair and Assistant Secretary of Defense Dr. James Anderson were guest speakers at the 2019 JUMP Annual Dinner. Photo by Nick Klein. The fourth Japan-U.S. Military Program (JUMP) Annual Dinner was held on Wednesday, March 20, at the Army and Navy Club on Farragut Square in Washington, D.C. Assistant Secretary of Defense for Strategy, Plans, and Capabilities, Dr. James Anderson was the keynote speaker. The reception began at 5:30 pm in the Ballroom, and dinner was served at 6:30 pm in the Main Dining Room. The suggested uniform was Service “A” for service-members and business attire for civilians and retirees. With nearly 110 attendees, this year marked the largest dinner to date. This year’s keynote speaker was Assistant Secretary of Defense for Strategy, Plans, and Capabilities Dr. James H. Anderson. Prior to this appointment, Dr. Anderson served three years as the Vice President for Academic Affairs at the Marine Corps University. From 2012 to 2015, he was Dean of Academics and Deputy Director at the Marine Corps War College. From 2009 to 2012, he worked as the Professor of International and Security Studies at the George C. Marshall Center for European Security Studies, where he directed the Program in Advanced Security Studies. 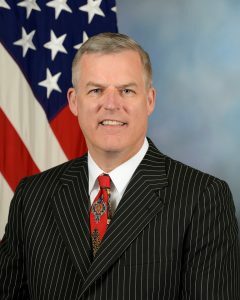 Dr. Anderson served in the Office of the Secretary of Defense from 2001 to 2009, where he was Director of Middle East Policy in International Security Affairs, among other positions. JUMP seeks to bring together those American service members, government employees, and their families who have served in Japan and would like to remain in contact with Japanese culture, language, and people, as well as stay informed about the U.S.-Japan Alliance. The program is a collaboration between Sasakawa USA, the National Association of Japan America Societies (NAJAS), and the Embassy of Japan in Washington, D.C. Previously announced keynote speaker Assistant Secretary of Defense for Asian and Pacific Security Affairs Mr. Randall Schriver was unable to attend due to unforeseen circumstances. The 2018 JUMP Annual Dinner featured Secretary of the Air Force Heather Wilson who discussed the demanding and changing role of the U.S. Air Force in the Indo-Pacific. The 2017 dinner featured a keynote address by the Chief of Naval Operations, Admiral John Richardson, who discussed the state of the U.S.-Japan Alliance and the challenges of growing maritime competition in the Asia Pacific, and a speech by Admiral (ret.) Dennis Blair, former Director of National Intelligence and Commander of U.S. Pacific Command. For the 2016 Annual Dinner discussion, General Robert Neller, Commandant of the Marine Corps, remarked on the importance of maintaining strong allies to approach growing challenges and potential friction points in the Pacific. If you aren’t already a member of JUMP, sign up now: Join JUMP.